Van Jones puts these 12 simple strategies into daily practice. As he says in The Grinder's Guidebook, " Significant and sustainable success is reserved for the takers and not for the waiters... We have to get up, get out, grind and go get it!" Significant and Sustainable success won't wait for you. You have to go get it and grind until your dreams and goals are achieved. We each have our own idea about how to measure success. Our journeys to success are each different. The Grinder's Guidebook will show you how to evaluate your progress and direct your short, mid, and long term goals as you toil and grind daily into the masterpiece that you were created to become. You will learn things about yourself that you didn't know or ever thought were possible. 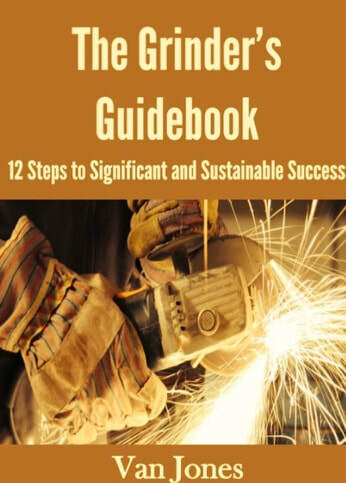 Ultimately, this guidebook will create a blueprint to present and future successes. The Grinder's Guidebook will lead you to dig deep into your purpose for living and work tirelessly to be what God has created you to be. ​and all major credit cards are accepted. Convenience and shipping fees will be applied at checkout.